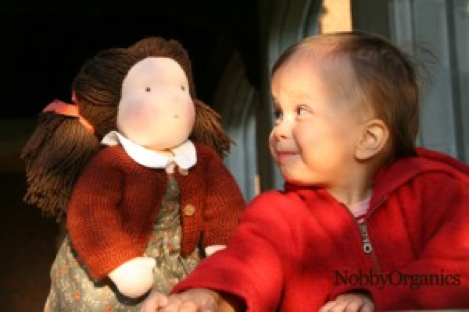 What is a Waldorf Doll? 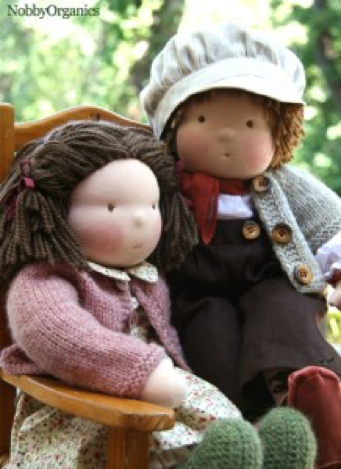 A Waldorf doll is a type of doll used in Waldorf education. It is usually handmade from natural fibers and materials like wool, silk, and cotton, using traditional European doll-making techniques. Natural fibers are warm to the touch and feel more real, compared to synthetic and plastic materials used in the commercially produced dolls. The wool stuffing absorbs the child’s warmth, producing a soothing effect. Its facial features are intentionally made very simple, which helps to spark the child’s imagination. Depending on the child’s mood, the doll can be happy, sleepy, sad, or even angry and crying. A Waldorf doll is much more than just a toy; it’s a link between two worlds, the child’s and the adult’s. Children have a natural desire to imitate their parents’ behavior. They love to pretend to be doctors, teachers, cooks etc. and dolls usually become the first props in their pretend play. Doll play helps to develop language and social skills, making children more creative and less aggressive. By dressing and feeding dolls, children also further develop motor skills and coordination. Doll playing allows children to practice their future roles as adults, helping them develop love and care for other people. A Waldorf Doll becomes a friend, a true companion with whom a child shares her (or his) feelings, hopes, dreams, and adventures. A little blanket doll is the perfect first doll to introduce to a child as early as his first year. It usually has a formed head with a very simple face, often without any facial features, and a soft flannel body with small knots at the corners, bringing much relief to the swollen gums. You can even soak these knots in water or herbal tea and freeze them for a while to ease teething pain. 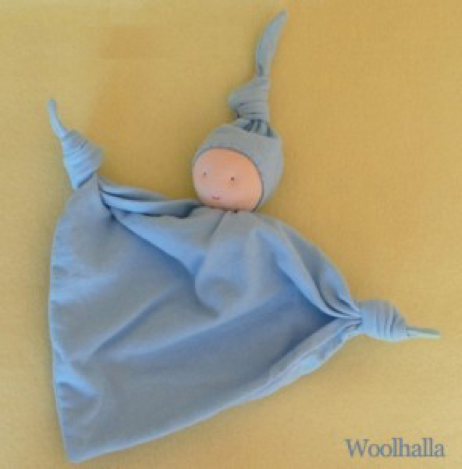 A lovely cuddle-baby Waldorf Doll, or a bunting style doll, designed without legs, are ideal for a toddler. These dolls are easy to grasp and to hold, and they usually don’t have hair that can be chewed on. Be sure that the doll doesn’t have small parts that can come off and be swallowed. At 4-6 years old, a child’s motor skills are developed enough to start enjoying the classic Waldorf “dress-up” dolls with longer hair. That is the age when children start to play imaginatively, imitating the world around them. Play becomes more complex, allowing the child to resolve situations that could be new for him or her. A 17-20-inch doll is an ideal size for this age. Making dolls for both girls and boys and having sons who play with dolls, I get many questions, usually from fathers of boys, if it’s appropriate for boys to play with dolls. I think the belief that by playing with dolls a boy can become less masculine is not backed up by any sound evidence. Would you stop a girl from playing with a hammer or a screwdriver because it might make her less feminine? I personally think that playing with dolls only shapes a boy’s personality for the better, helping him become a loving and caring father and husband in the future. Let the children learn trough their chosen play activities; it will help them flourish and learn the skills they will need for adult life!